Thanks for a great challenge, Bjorn. 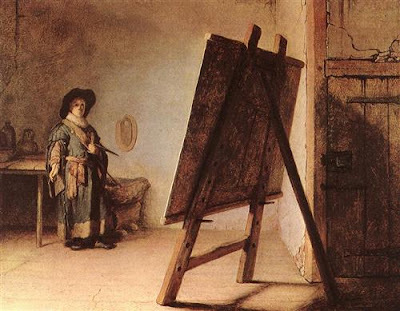 I assume that is a self-portrait by the master. But your task is hard for someone unskilled in artistry. I hope you manage to capture a story behind.. now it's time to put on my thinking cap before heading to bed. I must say this was a fantastic challenge! I tried to depict my thoughts while describing the painting.. along with telling a story. Hope I did it justice! Thank you Bjorn for this lovely opportunity :D This one's for you. My balky computer has let me out of my dungeon for the moment. Yay! Mhmmm thought you wanted something that was not directly related to the picture but simply the feelings that the painting evoked ... my mistake? I like what I have seen so far.. There are emotions of all kind relating to the creation.. I think you can see a lot of different things in the picture. Interesting challenge. I like it.